How cute! I like the layout and man is that a lot of brads.... whew... Great card America. Way to cute girl, I love all your brads. Wow, what a great card. I love how you incorporated St. Patty's day with the masculine theme. That ribbon with it is great. Very eye-catching...I love it! No need to re-do, in my opinion. Oh my gosh, that house mouse image is so darn cute, America. You did a beautiful job coloring the image. . .love the beautiful color combo too. Absolutely gorgeous card! Ooops, I think I commented on the wrong card on my first comment. LOL! Okay, I'm commenting on this card now. LOL! You make fabulous masculine cards, which I'm terrible at. Lovely job coloring the HM image as always. 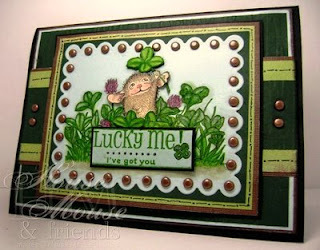 Your card makes for a fabulous masculine and St. Patrick Day card! Fabulous card - I just love the rich colours and that superbly coloured image. Thanks for your bithday song and dance wishes. I was 'gob smacked' when I saw your last weeks card - it was so very much similar to what I had planned for this week - ooops! Had to do some tweaking. Such a pretty card! I love the layout and the greens worked well together. sometimes, it is hard to keep St. Patrick's day cards from looking to boring or monochromatic, but yours has just the right elements to make it pop! Great Job! Another adorable creation, America! Love the sentiment! This is amazing! Love all those brads and the rich tones of green!! Oh my goodness, your coloring ROCKS! This is so cute! Love your coloring and layering of the image, and those brads really add a lot!